Rep. Keith Ellison is hoping to become chair of the Democratic National Committee. The Middle East Forum has written before about Representative Keith Ellison, who is currently in the running for chair of the Democratic National Committee. Rep. Ellison does not merely associate with extremist groups; he has espoused support for convicted terrorists and peddled conspiracy theories about the September 11 attacks. Our research now shows it goes even further than that: Ellison has also welcomed the financial backing of prominent extremists and terror financiers. The Islamist Money in Politics project (IMIP) tracks the political donations of over 1,400 prominent members of known Islamist organizations, such as the terror-supporting Holy Land Foundation and the Islamic Circle of North America (ICNA), the American wing of the Pakistani Jamaat e-Islami, which aims to obtain political power and form a global Islamic state. Keith Ellison is the single largest recipient of campaign donations in the IMIP database—having received nearly $200,000 dollars from prominent Islamists over his career. This, in isolation, is not necessarily a bad thing. It is natural for Muslims of all stripes to support the first Muslim elected to Congress. However, Ellison has the option of returning money donated by objectionable people—and has chosen instead to accept the money of donors tied to terror financing and extremism. 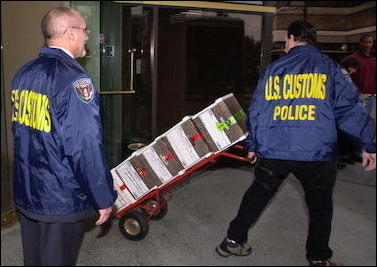 U.S. Customs police carry out boxes of evidence after raiding SAAR network businesses on March 20, 2002 in Herndon, VA.
Several donors were prominent leaders of a vast Saudi-funded web of purported charities, nonprofits, and financial firms, known as the "SAAR Network," that laundered money for terrorism. The SAAR Network illicitly funneled money to the organization of convicted terror financier Sami al-Arian, the North American head of Palestinian Islamic Jihad; and there is overwhelming evidence that it did the same for the terror group Hamas. Donors to Ellison who were officers in the SAAR Network include Jamal Barzinji, M. Yaqub Mirza, Hisham Altalib, and M. Omar Ashraf. Between them, they gave Ellison thousands of dollars. Ellison also accepted the donations of Esam Omeish, president of the Muslim American Society (MAS). MAS has been identified (in court testimony by convicted terror financier Abdurahman Alamoudi) as a front group for the Muslim Brotherhood. Omeish himself had been videotaped making public statements supporting the Muslim Brotherhood, and endorsing violent jihad. Public pressure following the release of this recording forced Omeish to resign in 2007 from a Virginia commission on immigration. Yet Omeish's extremism is apparently acceptable to Ellison. 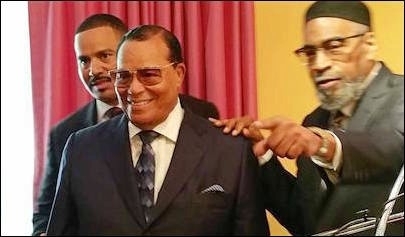 Luqman Abdul Haqq (right) with Nation of Islam leader Louis Farrakhan in 2015. Rep. Ellison also enjoys the support of Luqman Abdul Haqq, alias Kenny Gamble. A former music mogul and convert to Islam, Gamble has built a network of organizations for the ostensible purpose of urban renewal in South Philadelphia. He openly speaks of creating an "Africatown" enclave in South Philadelphia to parallel existing Chinatowns or Russian enclaves. But critics argue that his true goal is to build a specifically black Muslim enclave. In an interview with Saudi TV, Gamble and his associates spoke of using public money to build South Philadelphia housing, which was then disproportionately awarded to Muslim residents. Gamble is also a leading official of the Muslim Alliance in North America (MANA), which was originally founded in response to the arrest of cop-killer Jamil Al-Amin, formerly known as H. Rap Brown. MANA considers Al-Amin its "Ameer" (leader) and has continued to take inspiration from him, raising thousands of dollars for his legal defense team. Al-Amin is not the only violent criminal associated with MANA. Luqman Ameen Abdullah, who was shot in a 2009 FBI raid, was a Detroit imam who preached violent black Muslim separatism and was involved in the extremist organization "Umma"(which Al-Amin runs from his jail cell). Abdullah was also a member of MANA's Majlis ash-Shura [executive council] alongside Kenny Gamble. Ellison has not returned Gamble's money either. Rep. Ellison has made few moves to distance himself from Islamist extremism. Rep. Ellison has made few moves to distance himself from Islamist extremism. Ellison had been scheduled to speak at the December ICNA-MAS convention alongside some truly odious figures, but pulled out at the last minute in the face of public pressure. But this was apparently nothing more than a calculated move to defend his chances at the DNC chairmanship. 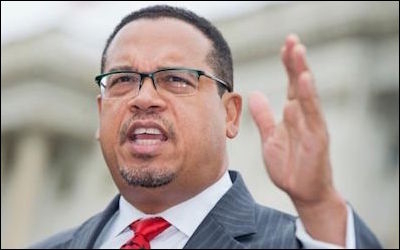 Ellison did not actually condemn the extremist speakers at ICNA-MAS, nor did he hesitate to sign up for the upcoming ICNA-MAS Convention in April – safely after the DNC chair is chosen – alongside some of the same extremist speakers. Ultimately, the selection of DNC Chair will fall to the Democratic Party. But Democrats must decide whether they want to be led by a man like Rep. Ellison, who cloaks himself in the mantle of progressivism while actively encouraging extremism.